Courtesy of the Steamboat Springs Chamber of Commerce. Join residents, competitors, and tourists alike for a celebration that embraces Steamboat's western heritage and tradition of winter sports. 'Tis the season for cabin fever. There's a cure for that (... more cowbell, kidding, but cowbells are totally welcome): The Steamboat Springs Winter Carnival. This year's event, February 6-10, marks the 106th year that people have flocked to the mountain town to dust the winter blues off their shoulders and kick up their heels. This carnival is not to be missed. It is the oldest, continuous winter carnival west of the Mississippi. The Steamboat Springs Winter Sports Club and its founder, Carl Howelsen (who is referred to the 'Father of Colorado Skiing') founded the event to give people a chance to let loose a little during cold-weather months. It also encouraged more to get involved in recreational snow sports, helping put Colorado on the map as a winter playground. "The event continues to this day as a way to celebrate winter, as a reason for neighbors to gather, and as an opportunity for everyone to experience a piece of Ski Town USA history and tradition," says the Steamboat Springs Chamber of Commerce. The carnival is quite the experience for all ages. "Mention a parade and fireworks and people say that’s typical. Talk about adults on shovels being pulled down Main Street behind horses or skiers jumping through fiery hoops and people stop to listen," the chamber says. "This unique event includes everything from kids pulled on skis behind horses down a snow-covered main street, to the Lighted Man at the Night Show Extravaganza who's battery-powered suit weighs 70 pounds." Throughout the carnival, you can participate in or watch a variety of skiing events, including jumping and snowboarding events, as well as check out a snow sculpture contest, the mountain soiree and so much more. Saturday and Sunday, February 9 and 10, respectively, are the highlight of the event, hosting the Winter Carnival Street Events and Night Show Extravaganza. 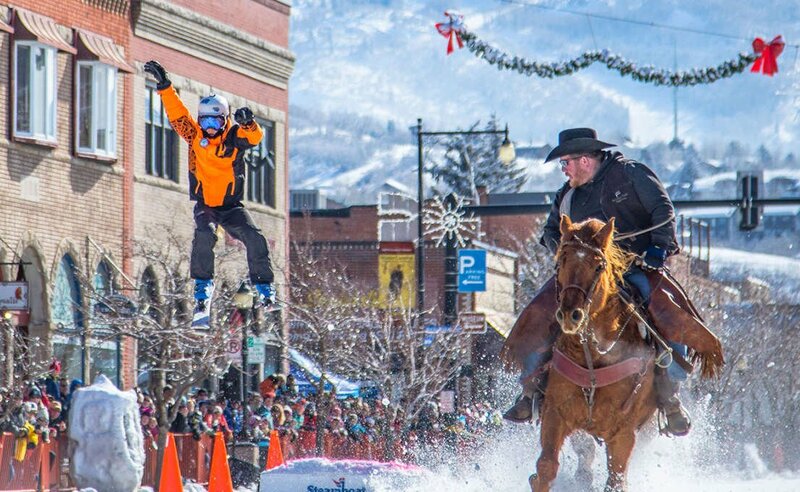 You'll be treated to many events, including the crowd favorite "Donkey Jump," which sees skiers being hauled by horses down Main Street and off a jump for up to 40 or 50 feet. On Saturday, Howelsen Hill is lit up with athletes flipping through the air off the jumps and carving their way down the mountain, all followed by the twinkle light-wrapped, roman-candle-sporting Lighted Man and fireworks. And don't forget the parade on February 10! Here are some of the highlights of the Night Extravaganza celebration, courtesy of Steamboat Springs Winter Sports Club. If you are interested in heading up to Steamboat for the Winter Carnival, check out Steamboat's Chamber of Commerce website, which is full of all the details on events, lodging, and so much more! A Winter Carnival button is required for entry and spectating at all events, so you can check out the schedule for more information. "With over a century behind it as the official organizer of the Winter Carnival, the Steamboat Springs Winter Sports Club is proud to host this historic event that has been listed as one of the Top 10 Winter Carnivals in the World by National Geographic," says the Steamboat Springs Winter Sports Club. "We are privileged to celebrate our history and heritage in this idyllic mountain town with the largesse of a world-class Winter Carnival. We invite you to join us as we celebrate the unique heritage and community of the one, the only, Ski Town, USA." Will you be attending this year's Steamboat Springs Winter Carnival? Let us know what you're looking forward to the most in the comments below.